Recently i needed to move my configuration from one environment to another. I expected it to be easy thanks to the Data Entities available in AX 7. However being the first time to do this it was a bit of a pain. First off it took me a while to locate the Data Entity I wanted to use. As its a long list I tend to apply a filter "Retail" to my the list of Data Entities.However turns out that they have a I should have used the filter "POS". In order to move the screen layouts few important entities are the POS Button Grid, POS button grid buttons, and the POS screen layout button grid zones . These hold the definitions of the grids displayed in your POS screen layout, buttons (which trigger functionality in the POS) within them and the grid zones assigned to those screen layouts. Another issue is assigning the images associated with the buttons. If the images on your environments have different indexes , you need to again associate each of the button with its respective image. This becomes a harder task because the AX 7 web client tries to load all the images at once when you click on Select Image. The alternative to this is to use Table Browser, I accessed table browser from the AX server, however thanks to my colleague Praveen Parameswaran i learnt that the table browser can be accessed by using a url (more about this here ). 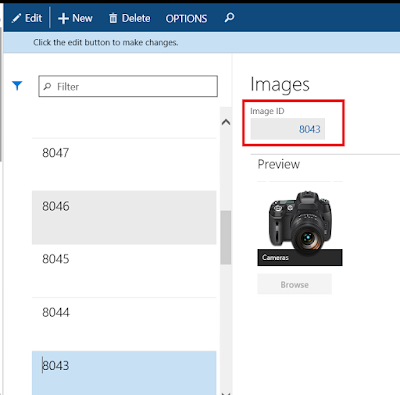 Next you need to scroll to the field PictureId and replace it by the id of the Image you want to assign to the button.